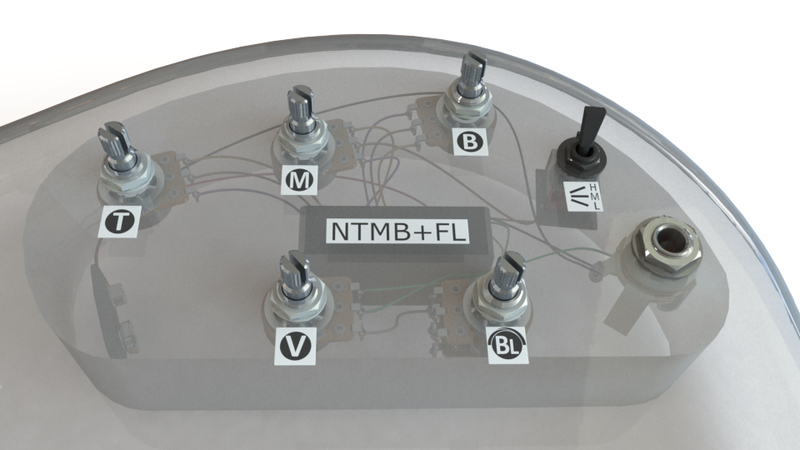 The NTMB+FL is well known to professionals for its very low noise and precise control. It is a 3-band tone control preamp with fully independent Bass, Mid and Treble controls. Often used in fretless instruments for more focused mid control, the FL voice is the same as the original Bartolini TMB from the 1980s. 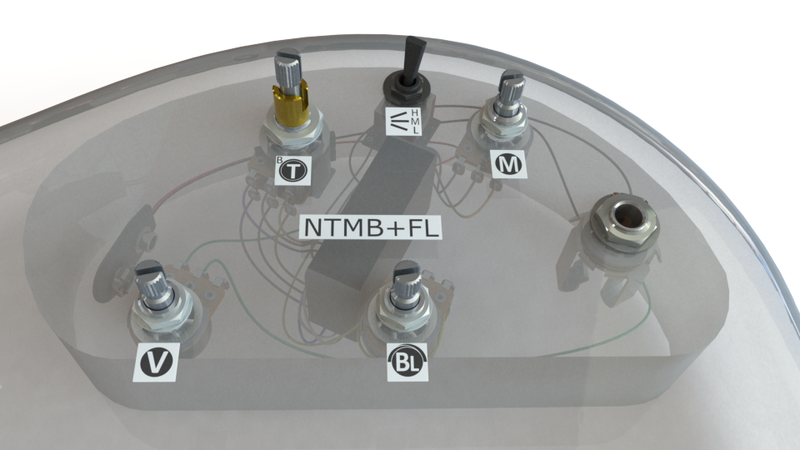 We re-packed the parts of the NTMB/918FL and NTMB3 2-part preamp system into a single module to make the NTMB+FL. The circuitry and parts are identical. Not only does the NTMB+FL take less space, but it also requires fewer wires, has even better noise rejection, and is easier to install. The NTMB+FL features a pre-wired adjustable gain trimmer which allows you to boost the input signal up to 12dB (4X) to match the output of several instruments or tune the output to drive your level-sensitive effects. Like all of our preamps, the NTMB+FL is internally shielded to reject electromagnetic noise and includes internal filters to block AM and FM radio on the input. 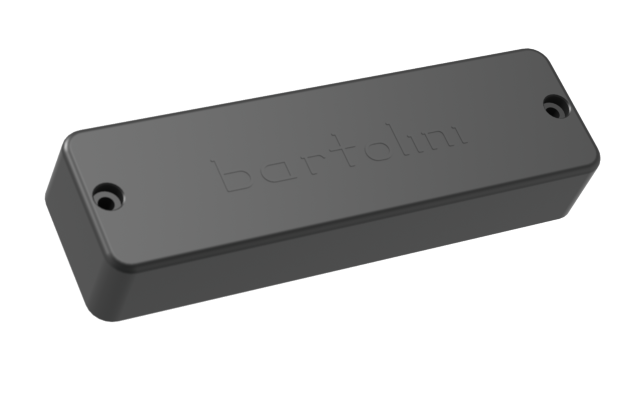 Bartolini set the standard of fully sealing the sensitive electronics. We use professional double tin plated pure copper wire with durable semi-rigid insulation. This ensures the 5” pre-stripped wires don’t flop around in the cavity and the wires don’t cut through the insulation over time. 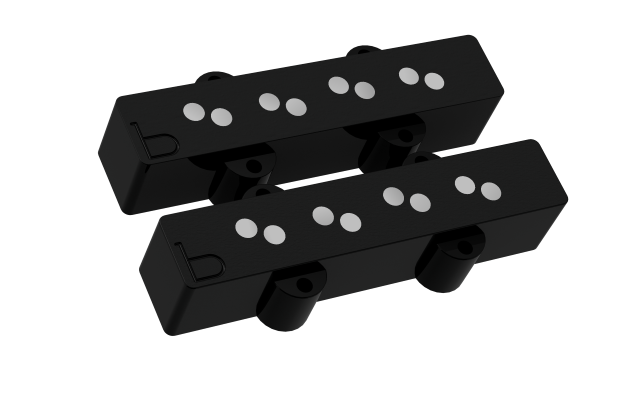 Installation is straightforward by connecting the EQ band wires to your 50KΩ linear potentiometers along with volume control, battery connection, and output jack. Or you can use one of our pre-wired harnesses to make your upgrade even easier. 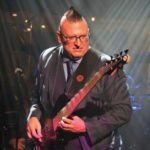 The preamp can be used with either a single 9-volt battery (9-volt operation) or two 9-volt batteries wired in series (18-volt operation) for 6dB extra headroom with no tonal change. 250Hz center frequency can be tuned with a series capacitor. See the wiring diagram for more info. 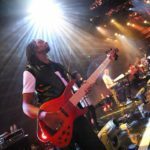 Thicken or thin your tone with mid control. Mid boost lets you cut through the mix, and mid cut provides great slap tone.